We are pleased to announce that Quiz Mode has officially launched and is now available for use. There is no need to download an update, all upgrades have been automatically incorporated into every account. In addition to the launch of this new mode, a new Account Homepage has been created, in addition to other esthetic and functional upgrades throughout the site. We have now completed our transition to an overall method of having two main reaction flashcard modes: Study Mode and Quiz Mode. 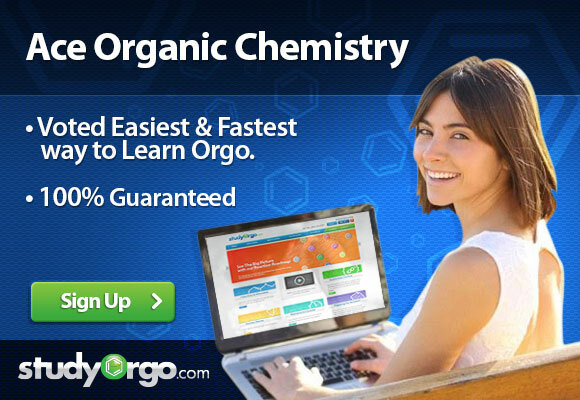 The original StudyOrgo.com flashcard system will now be known as Study Mode. It will remain as is with some tweaks including one major difference. 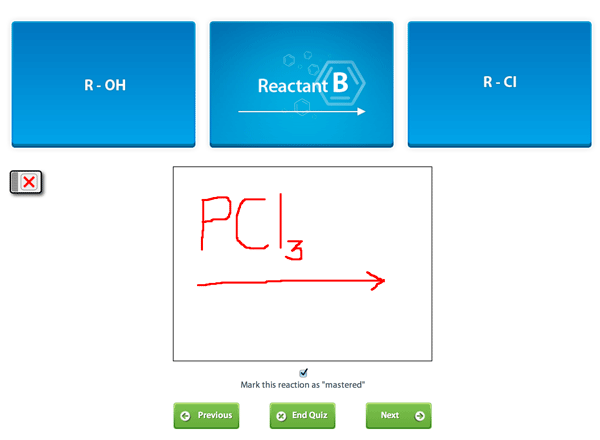 All reaction flashcards windows will now be revealed at baseline to facilitate learning of all the information on the flashcard without having to reveal each area of the card. However, should you want to use Study Mode in its original manner, you may click on the “Study Flashcards Covered” checkbox found on any flashcard page to restore the system to its original fashion. You now have the ability to construct custom quizzes to test your knowledge of the material learned in Study Mode in our new Quiz Mode. You have options of choosing specific reaction categories, number of questions and the part of the reaction that you would like to be quizzed on among other items. Use the drawing space below the reaction to draw your response. When ready, click on the covered window to reveal the answer. Compare your response to the correct answer. Once you have mastered a particular reaction, you may mark it as “mastered” by checking the box found underneath the reaction. When you end a particular quiz, review your performace using our review page. The marked as mastered feature is maintained between the two modes. You can even exit and save quizzes and continue working later. Your new account homepage organizes the main features of the Study Mode and Quiz Mode into one neat dashboard. Under the Study Mode section you can take advantage of helpful shortcuts such as recently viewed reactions, browse all reactions by name and review all reaction flashcards. Under the Quiz Mode section you can jump to recent quizzes or create a new quiz. There are also shortcuts to our additional materials such as the Summary Guide and Exercise Sets, Study Charts, and Reaction Roadmap. Feel free to log in and browse the changes and take advantage of our new and improved program.